What is VLC Player ? => VLC media player is an open source, free software media player and multimedia framework written by the VideoLAN project. There are so many peoples who is facing issue while installing VLC Player on Linux and CentOS, Most of the peoples suffer with dependencies problem if they are going to install VLC Player using RPM or YUM. But Now you will find a very easy way to install VLC Player, I have created Bash Script to Install VLC Player with all Dependencies, So Forget about all problems Just Download and Run Bash Script which I have created for VLC Player Installation on RHEL 5. 1. You need to be root to run this script. 2. Download this VLC INSTALLATION SCRIPT. 3. Execute following Command where you have downloaded the script. 5. Now Just Site Back and Relax for Few Minutes as per your Internet Connection it will Install VLC Player Without any error. 6. Remember you have to be normal user to run VLC Player, You cannot Run VLC Player as root. 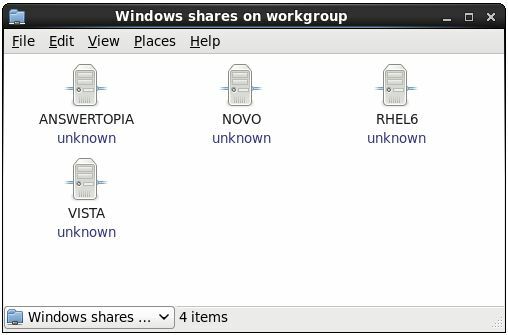 Samba allows both RHEL resources to be shared with Windows systems and Windows resources to be shared with RHEL systems. RHEL accesses Windows resources using a package named samba-client. RHEL resources, on the other hand, are shared with Windows systems using a package named samba. 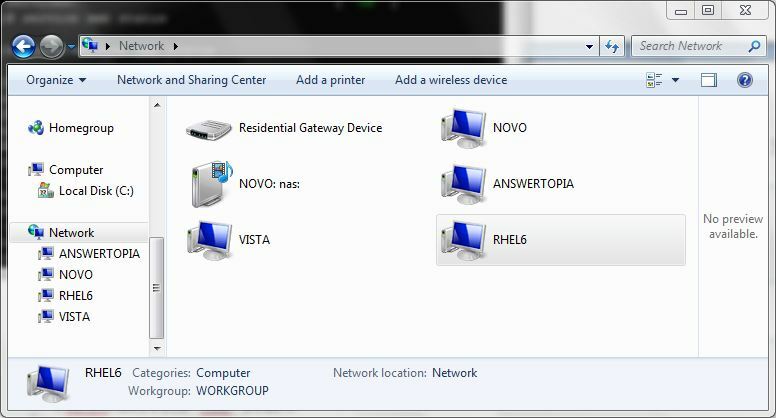 Typically, the samba-client is installed and configured by default allowing you to browse available Windows resources without any additional work (this is covered later in the chapter). In order to allow an RHEL 6 system to share resources with Windows systems, however, some more work is required. Next, the firewall currently protecting the RHEL system needs to be configured to allow Samba traffic. To achieve this, run the Firewall Configuration tool by selecting the System -> Administration -> Firewall menu option and select the check box next to Samba in the Trusted Services section of the tool. Click Apply and OK to commit the change. In releases of Red Hat Enterprise Linux prior to release 6, a user friendly graphical tool named system-config-samba was provided to assist in the configuration of Samba. In RHEL 6, however, this tool has been removed. This means that the Samba environment must be configured manually within the /etc/samba/smb.conf file and using the smbpasswd command line tool. 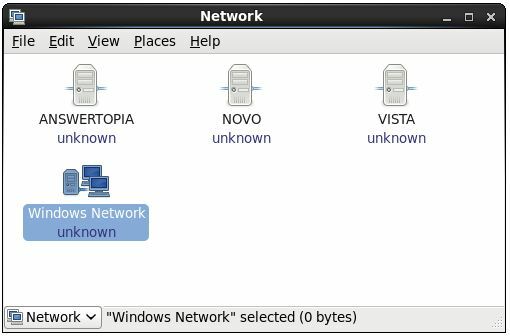 Whilst the loss of system-config-samba may be mourned by those who relied on it, the tool’s simplicity actually masked many of the more advanced features of Samba. In practice, much more can be achieved by tasking the time to understand the intricacies of the smb.conf file. For the purposes of this chapter we will look at joining an RHEL 6 system to a Windows workgroup and setting up a directory as a shared resource that can be accessed by a specific user. Double clicking on the tmp shred resource will display a listing of the files and directories contained therein. 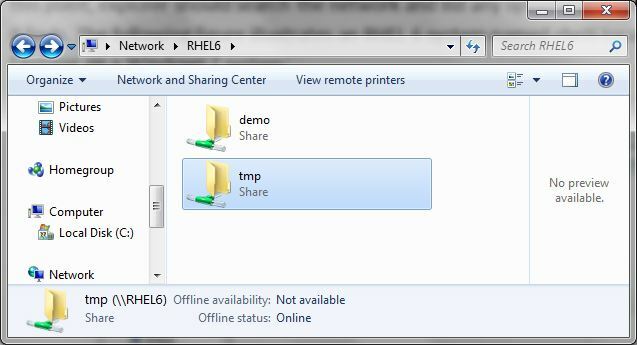 Finally, double clicking on a computer will list the shared resources available for access from the RHEL client. Alternatively, if rpm generates a “package httpd is not installed” then the next step, obviously, is to install it. This can be performed either from the command-line or using the Add/Remove Software tool. To use this tool, open the System -> Administration desktop menu and select Add/Remove Software. Enter your root password if prompted to do so. Select the Search tab and search for httpd. 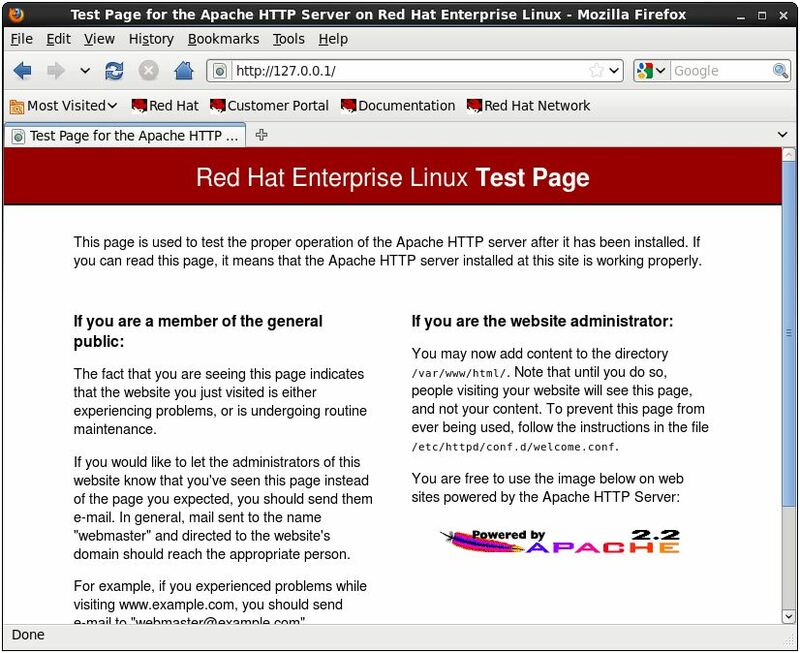 After the search completes the Apache HTTP Server should be listed in the search results. Click on the toggle next to the httpd server. Finally, click on the Apply button to begin the installation. Note that we had to quote the shift operator since it would otherwise be misinterpreted as a “redirect stdout and append” operator. Go into: C:/Program Files/Messenger. Rename the Messenger folder to “MessengerOFF”. There is One for Everyone !! ‘task manger has been disabled by ur administrator’…, and also i cant access my registry too..!! what may have caused this problem…. is it becos of some VIRUS…???? how can i repair this without re installing…?? any particular software?? As far as I know one can’t have IIS running on XP Home. I think u will have to upgrade it to XP Prof.
in proff That’s simple get the Win XP CD, go to control panel–>add/remove programs and then to add/remove windows components. There u will find the option for adding IIS, just check the checkbox and follow the instructions. You r done!! IF U WANT UR FILES THT WERE HIDDEN U CAN TYPE *. * IN SEARCH AND ALSO TICK THE OPTION “INCLUDE HIDDEN FILES”. NOW SEARCH IN THE DRIVE IN WHICH U STORED UR FILES, U WILL GET UR FILES BUT TO GET BACK THE OPTION U EITHER HAVE TO REINSTALL WINDOWS OR REPAIR IT. well this is as far as i know.. Assuming that you have tried the basic steps i am directly trying with the most possible solutions. This issue most commmonly occurs because the settings are not saved. Also there might be some startup program which is diabling the Systray.exe from loading up. 1) Re-enable the volume icon by disabling and then enabling Place volume icon in the taskbar in the Sound and Audio applet. 2) Then copy the following text which is in red into a notepad file and then save it as “fix.reg”. Please make sure that there is no .txt extension after that. 3) Merge the file to the registry by simply double clicking on it. This should definitely work. Please reply back with the status. 5)Whenever i try d’loading stuff from the net, the download starts and the comp just restarts. due to dis i have to install d’load managers wich i hate. help needed anyone. i have win xp! If the computer just restarts itself, it cud possibly be an application crash..
check the Dr.watson log for details..
check the path for the log here… open the log and check which application is causing the crash. turn of automatic reboot,cos you wud miss it if there is a BSOD being generated. 6)I accidentally deleted the Show Desktop icon which sits normally on the bottom left hand corner of the Taskbar. How do I restore the icon? The Show Desktop icon file should be available now. Click Start, Run, and type Notepad.exe. Copy the following contents to Notepad.